India, the land of spirituality, brings us stories of great Rishis (sages) and Sannyasis, whose extraordinary lives of piety and devotion went on to become an undying inspiration for generations to come. While some of these highly spiritual seers veritably moved mountains and earned the benevolence and boons of the Lord, some others displayed strong personalities and, more importantly, a fiery temper to go with it. Rishis are supposed to be calm and peaceful at all times, due to their deep involvement in prayer and penance. They also strictly follow a satvik diet, which involves consuming only seasonal fruits and vegetables, legumes and whole grains, nuts, seeds, oil and certain other dairy products and non-meat-based foods. Such foods are believed to further calm the mind and the body, to make the person's aura more serene and divine. In spite of all this, celebrated and venerated rishis such as Vishwamitra and Durvasa were rather infamous for their short temper. Why and how did this happen? Let us now take a look at the lives of these two powerful Rishis. Brahmarishi Vishwamitra is one of the most respected rishis of India. Credited as the author of most of Mandala 3 of the Rigveda, including the sacred and all-powerful Gayatri Mantra, he is revered in the Puranas as the first of only 24 rishis who have understood the actual power of the mantra. The Balakanda of the Valmiki Ramayana narrates in detail the life and times of this sage. The Mahabharata further sketches his relationship with Menaka, which resulted in the birth of his daughter, Shakuntala. The name "Vishwamitra" literally means "friend of the world". He is a popular figure in other Southeast Asian cultures as well. In those regions, he is referred to by other names such as Swamil (in Thailand), Bodaw (in Myanmar), Wiswamitra (in Java) and Nila Purba (in Malaysia). 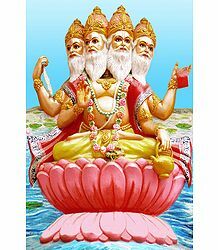 Vishwamitra was a king of ancient India. He was also called Kaushika, as he was a descendant of the Kusha family. Originally the ruler of the Chandravanshis, he was the king of Kanyakubja. A brave warrior, he was the great-grandson of king Kusha (not Lord Rama's son Kusha), who was the manasaputra (son arising out of the mind) of Lord Brahma himself. Kusha had a son, the mighty, powerful and righteous Kushanabha, also referred to as Gaadhi. His illustrious son, Vishwamitra, ably ruled the kingdom for many thousands of years, before he finally gave up everything and went on to become a saint. The Vishnu Purana and Harivamsha chapter 27 of the Mahabharata narrates the birth of this great sage. According to this Purana, Kushanabha married a damsel hailing from the Purukutsa dynasty. They were descendants of the Ishvaku king Trasadasyu. In due course of time, they had a son named Gaadhi, who then had a daughter named Satyavati (not the Satyavati from the Mahabharata). Satyavati married an old Brahmin called Ruchika. He was the foremost member of the Bhrigu race. Ruchika wanted a son possessing the qualities of a Brahmin and hence, he gave Satyavati a charu (sacrificial offering), which he had prepared himself. He then also gave her mother another charu, to make her conceive a son with a Kshatriya's (warrior) characteristics. Satyavati's mother secretly asked her daughter to exchange her charu with her. This resulted in Satyavati's mother giving birth to Vishwamitra, the son of a Kshatriya Gaadhi. He had all the qualities of a Brahmin, just as Ruchika had desired. In the meantime, Satyavati gave birth to Jamadagni, who was the father of Parashurama. Jamadagni was a Brahmin, who possessed the qualities of a Kshatriya. Vishwamitra always had a personality clash with sage Vasishtha. In one instance, the former cursed king Harishchandra that he would turn into a crane. When Vasishtha came to know of this, he turned himself into a crane too, so that he could accompany the king. There were many more clashes between the two sages. In some cases, it became so extreme that Lord Brahma had to interfere to defuse the tension between them. On yet another occasion, Vasishtha singlehandedly destroyed Vishwamitra's entire army by using his great spiritual and mystical powers. The latter, seething with rage, decided to undertake austere penance in order to avenge this humiliation. He then performed tapasya (penance) for several years to appease Lord Shiva. The Lord finally appeared and granted him the knowledge of celestial weaponry. Filled with pride at his achievement, Vishwamitra proceeded to Vasishtha's ashrama (hermitage) and caused utter havoc, also killing Vasishtha's thousand sons. An enraged Vasishtha brought forth his brahmadanda, a wooden stick, which contained the power of Brahma himself. It consumed all of Vishwamitra's most powerful weapons, including his Brahmastra. He then attempted to attack his marauder, but the Devas interjected in time and stopped him from doing the unthinkable. In this way, Vishwamitra was humiliated once again at the hands of Sage Vasishtha. The latter then worked to restore his ashrama. The above-mentioned incident was a turning point in Vishwamitra's life. He realized that spiritual power would always be far greater than physical might. Seeking to become a greater spiritual force than Vasishtha, he renounced his kingdom and took up sannyasa. He undertook severe penance, after which Brahma appeared before him and gave him the title of Rajarishi; the Royal One who became a Rishi. He continued to perform even more severe austerities. In the meantime, he also had a daughter by the name of Shakuntala, from his relationship with the beautiful apsara Menaka. 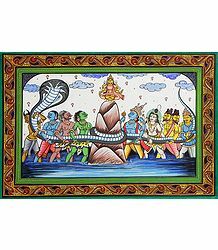 Menaka was born from the churning of the ocean by the Devas and the Asuras (demons), during the Samudra Manthan episode. She was one of the most beautiful, talented and intelligent apsaras. She went on to become one of the prime apsaras in Lord Indra's court. Vishwamitra's severe penance and his rapid climb in the spiritual realm frightened Indra and made him insecure. The former had already tried to create another heaven on his own, with his siddhis. Indra was concerned that, if the Sage was not stopped in his tracks, he would manage to usurp his position as King of the Devas. He then decided to send Menaka down to Earth to lure the rishi and distract him from his penance. Menaka successfully completed her mission – the sage was consumed with lust and passion the moment he set his eyes on her. However, Menaka herself fell for him. They entered into a relationship and lived together for 10 years. During this time, a baby girl was born to them. This girl, called Shakuntala, later grew up in Sage Kanva's ashrama. When Vishwamitra realized how he had been tricked by Indra, he flew into a rage. However, he loved Menaka deeply and also knew the true extent of her feelings for him. So he told her that she would be separated from him forever. Menaka was very proud of her own youth and beauty. Kaushika knew this and cursed her that she would not possess this beauty in her next birth. Several years later, Shakuntala fell in love with King Dushyanta and gave birth to a child called Bharata. In due course of time, he ascended the throne and came to be known as Emperor Bharata, the one after whom India was first named. Kaushika then went to the banks of the river Kaushiki, which was the spirit of his own sister. There, he continued his penance for yet another thousand years. This time, Brahma bestowed upon him the title of Maharishi. He, however, told him that he could not become a Jitendriya just as yet, as he still had not conquered his passions. This had been evident by the fact that Vishwamitra had cursed Indra's other apsara, Rambha. She had been sent down by the latter to destroy his penance once again. When he realized that Indra was trying to trick him yet again, he was absolutely furious and cursed Rambha that she would turn into a stone and remain like that for a thousand years. After cursing Rambha, Kaushika went to the highest mountain of the Himalayas to undertake more penance. This time, he stopped eating and reduced his breathing to the barest possible minimum, just in order to live. He was again tested by Indra, who disguised himself as a poor Brahmin, begging for food. He approached Kaushika just as the latter was getting ready to break his fast after several years. He readily gave his food away and resumed his meditation. Vishwamitra had faced several obstacles along his journey towards becoming a Brahmarishi. This made him mellow, freeing him up of his greed, jealousy, anger and all other negative emotions. The Brahmin tried his level best to irk him and make him angry. But Vishwamitra continued to remain calm and smiling throughout; thus proving that he had gained complete control over his emotions and passions. He continued thus for a thousand years, after which Brahma again appeared before him. He told him to approach Vasishtha, as he alone could bestow the title of Brahmarishi upon him. He also officially named him Vishwamitra, the "Friend of the Whole World". Vishwamitra then went to Vasishtha's ashrama. Initially, he felt a little pride in coming so close to becoming a Brahmarishi. But once Vasishtha blessed him, he at once felt all his pride leaving him, thus making his heart pure and desire-free. Sensing this change in him, Vasishtha responded by greeting him affectionately and embracing him. With this, the long feud between them ended instantly and for all time. Thus, after facing thousands of years of immense difficulties, Vishwamitra was finally conferred the title of Brahmarishi, by Rishi Vasishtha himself. 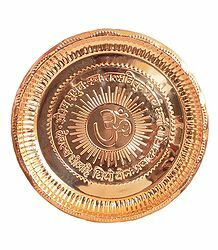 Sage Vishwamitra is said to have found the sacred Gayatri Mantra. This is a verse from a sukta of the Rigveda and Gayatri is the name of the Vedic meter in which this verse has been composed. The Gayatri Mantra is regarded as the highest and most powerful prayer in Hinduism and is still widely chanted around the world. In the olden days, women were barred from chanting this mantra. However, modern reforms and schools of thought today include women and people of all castes in its recitation and propagation. Vishwamitra is known to have created his own version of Heaven, named as the Trishanku Swarga. King Trishanku once asked his guru, Rishi Vasishtha, to send him to heaven while he was still in his own body. The guru told him that there was no way one could experience heaven without first leaving their body. The king asked Vasishtha's hundred sons if they could help fulfill his desire. Offended and outraged that he had no respect for their father, they refused and cursed Trishanku that he would turn into a Chandala or untouchable. Immediately, he was transformed into a person smeared with ash, clothed in black and wearing iron jewelry. When he entered his kingdom looking thus, his subjects failed to recognize him and drove him out of there. Trishanku then came across Vishwamitra and requested him to help him out. The latter agreed and organized a great yagna (sacrificial fire ritual) to appease the Devas, pleading them to accept Trishanku into heaven. When none of the Devas responded, the angry Vishwamitra used his siddhis and ordered Trishanku to ascend to heaven. To the utter amazement of all present there, Trishanku rose to the skies and actually reached the gate of heaven. There, Indra pushed him back down to Earth. Indra's act enraged Vishwamitra. He immediately began creating another Universe (including another Brahma), specially designed for Trishanku, calling it the Trishanku Swarga. He had only concluded the work on the Universe, when Brihaspati ordered him to stop. Trishanku, however, could not fully transcend to his exclusive Swarga. He remained fixed in an upside-down position in the sky. Finally, he was transformed into a constellation, which is now known as Crux. During the course of creating the Trishanku Swarga, Vishwamitra ended up exhausting all his yogic powers and had to start his austerities again, in order to achieve his dream of becoming a Brahmarishi. Kaushika once helped a young boy named Shunashepa from being sacrificed at a ritual. His parents had sold him to Harishchandra (Ambarisha), so that the latter could sacrifice him at his yagna, in order to please Lord Varuna. Originally, it had been decided that the king's son, Rohit, would be sacrificed at the ritual. But the young boy refused to be sacrificed and hence, Shunashepa was to take his place. The young and terrified Shunashepa approached Kaushika and begged to be saved. Taking pity on him, the sage taught him some secret mantras, which he should chant at the ceremony. The boy did as he was told. He chanted the mantras and was blessed by both Indra and Varuna. With their blessings, Ambarisha's ceremony was successfully completed, without having to sacrifice anyone for it. According to another version of the story, Shunashepa was actually the lost son of Vishwamitra. Originally named Vishwartha, he was abducted by the enemy king, Asura Shambar. Shambar's daughter, Ugra, fell in love with the young prince and convinced him to marry her. Pleased with the boy's character and behavior, King Shambar also agreed to the marriage. Soon after the marriage, the Bharatas won the battle against Shambar. When they discovered that their prince Vishwartha was alive, they were elated. However, they could not accept Ugra as their future queen, as she was an Asura. In order to convert Ugra into an Aryan, Vishwartha created the Gayatri Mantra. But people still refused to accept her presence in his life. Soon, she gave birth to a son. Fearing that the public may do some harm to the child, Ugra secretly sent him to the great female sage Lopamudra, requesting her to take good care of him. The son was safe, but the people killed Ugra. This son was later asked to sacrifice himself at Ambarisha's ceremony. Vishwamitra enjoys a prominent place in the epic Ramayana. Here, he was the preceptor of Rama; the illustrious Prince of Ayodhya; and his brother Lakshmana. The sage gave them the knowledge of the astras and shastras (weaponry); also giving them advanced lessons in religion and philosophy. He also guided them to slay powerful demons such as Taraka, Maricha and Subahu. 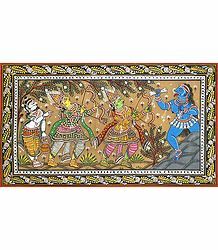 Further, he was the one who lead Rama to the Swayamvara ceremony of Sita, who eventually went on to become the wife of Rama. Brahmins who come from the Kaushika or Vishwamitra gotra are thought to be aggressive and wrathful, as they are believed to be descendants of the Kshatriya caste. People belonging to the Vishwamitra gotra revere Brahmarishi Vishwamitra as their ancestor. Both Brahmins and some Kshatriyas too belong to the Kaushika gotra. Brahmarishi Vishwamitra is worshipped in the Sri Aabathsahayeshwarar Temple in Alangudi, which is located in the Thanjavur district of Tamil Nadu. This ancient temple is believed to be nearly 2000 years old. Rishi Durvasa, also known as Durvasas, is another powerful, yet headstrong, sage in Hinduism. The son of Atri and Anasuya, he was infamous for his extremely short temper. His sharp tongue and tendency to hurl curses on people made everyone scared of him. Hence, he was received with great respect and reverence everywhere he went; whether it was the Earth or the Devaloka (the Heavens). According to legend in modern Azamgarh, Durvasa's ashrama was situated at the confluence of the Tons River and the Majhuee River, north of the Phulpur Tehsil headquarters. His temple, called the Rishi Durvasa Temple, is situated in Palwal district, Haryana. The Brahmanda Purana relates a legend associated with the birth of Durvasa. According to this Purana, Brahma and Shiva once got into a heated argument. What started in a small way soon turned out to be a violent quarrel. Fearing the worst, the Devas fled from the presence of the mighty Shiva. Even Shiva's consort, Parvati, got fed up and complained that her husband was now becoming impossible to live with. Realizing how his anger was disturbing others, he decided to deposit it all into Anasuya, the wife of Rishi Atri. From this aspect of Shiva, which was deposited into Anasuya, was born a child. He was named Durvasa (the one who is difficult to live with). Due to the fact that he was born of Shiva's anger, he too displayed the Lord's fiery temper. The Bhagata Purana gives a different account of the story of Durvasa's birth. According to this version, Atri desired a son and so, performer severe austerities to appease the Supreme Being. He wanted his son to be just like the Divine One. Pleased with his penance, Brahma, Vishnu and Shiva blessed the sage that he would beget sons, who would display aspects of all them within themselves. Soon, Anasuya gave birth to Soma (Brahma's incarnation), Dattatreya (Vishnu's incarnation) and Durvasa (Shiva's incarnation). That is how Durvasa was born to the couple. According to the Vishnu Purana and the Padma Purana, a curse that Durvasa hurled upon Indra was the indirect cause of the Samudra Manthan episode (churning of the Mighty Ocean). The Agni Purana and the Srimad Bhagavata also mention Durvasa's involvement in the episode. The Vishnu Purana relates that Durvasa was once wandering the earth in a state of ecstasy. He happened to meet a Vidyadhari (celestial nymph) and demanded her to give him the heavenly wreath of flowers that she was wearing at the time. The nymph readily agreed and gave the garland to him and he immediately wore it on his brow. Very pleased with himself, he resumed his wanderings and came across Indra, riding his Elephant, Airavata. Still in a mad state of frenzy, Durvasa threw the garland at Indra. Indra caught it and placed it on Airavata's head. The elephant got irritated with the strong fragrance of the flowers; picked it up with his trunk; and threw it to the ground. Considering this as a gesture of disrespect, an enraged Durvasa cursed Indra that he would be cast down from his power and position, just as the King of the Devas had callously cast down his gift. Mortified and fearful of the consequences of Durvasa's curse, Indra immediately begged for the sage's forgiveness. However, the former refused to relent and just went on his way. The curse took effect and soon, Indra and the Devas lost their youthfulness and strength. Seizing this opportunity, the Asuras; led by Bali; waged war against them. The Devas then rushed to Brahma for help. He directed them to Vishnu, who advised them to declare a truce with the Asuras and request their help to churn the Ocean of Milk. Vishnu stated that the process of churning the ocean would give rise to the Devamrita (Nectar of Immortality). Drinking this would give them back their lost strength and vigor; thus helping them defeat the Asuras. He advised the Devas that they should tempt the Asuras by telling them that they would share their Amrita with them; also assuring them that he would see to it that the Asuras would not be able to get their hands on the Amrita. The Devas did as they were told. They churned the Ocean along with the Asuras. Once the Devamrita came out from the Ocean, Vishnu assumed the manifestation of Mohini and gave back the Amrita to the Devas. In the Bhagavata Purana, King Ambarisha was a great devotee of Lord Vishnu. He was extremely pious and always uttered only the truth. Once, he performed a yagna to appease his Ishtadevata (favorite Lord). So pleased was Vishnu with his devotion and sincerity that he blessed him with his own Sudarshana Chakra, saying that it would always protect him. Ambarisha later performed a religious rite known as the Ekadashi and Dwadashi Vrata for 1 whole year. During this vrata, the king would fast on the 11th day of every lunar month, breaking it only the next day. At the conclusion of one year, he undertook a final fast of 3 days, to mark the end of the vrata. As the time approached for him to break his fast, sage Durvasa approached Ambarisha. The king received him with due respect. Durvasa was pleased and requested the king to wait and not break his fast until he could go and finish his holy dip in the river Yamuna. 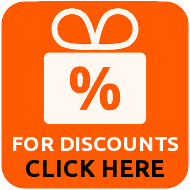 Ambarisha graciously agreed to do so. The auspicious moment arrived soon and the king had to break his fast, thus fulfilling his vow. However, Durvasa was nowhere to be seen. Ambarisha did not know what to do. On the one hand, it would be disrespectful to the sage to eat before him. On the other hand, he had to break his fast. The king then consulted his royal priests and, on their advice, broke his fast with just a sip of water. When Durvasa came to know about this, he flew into a rage, as he felt that Ambarisha had violated the respect due to him. In great anger, he pulled out a strand of his own hair, out of which rose a demon. He ordered the demon to kill the king. Immediately, Lord Vishnu's Sudarshana Chakra intervened and destroyed the demon. It then started chasing Durvasa. Frightened, the sage ran to Brahma and Shiva, requesting their protection. Both of them refused, since they could not interfere with the course of Vishnu's Sudarshana Chakra. Next, Durvasa went to Vishnu himself, begging to be forgiven for his arrogance. Vishnu also refused, saying that he was helpless, as he was bound by Ambarisha's pure devotion and adherence to the Dharma. He suggested that the sage should seek the king's forgiveness. Durvasa then returned to Ambarisha's palace and begged his pardon. The latter prayed to his Lord and pleaded him to recall his Sudarshana Chakra. 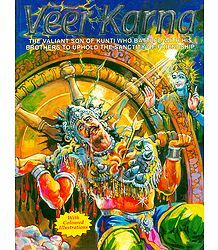 Answering his prayer, Vishnu took back his chakra, thus saving Durvasa's life. In the Uttara Kanda of the Valmiki Ramayana, Durvasa once came to Rama's doorstep. Seeing Lakshmana guarding the door, he demanded an audience with his elder brother. At that time, Lord Rama was busy having a private conversation with Lord Yama, the God of Death, who was disguised as an ascetic. Before going in for the meeting, Yama had requested Rama to keep the meeting confidential and also asked that anyone who tried to enter the room or hear their conversation was to be executed. Rama gave the former his word that his will would be done. He called Lakshmana and told him about Yama's orders, asking him to guard the gate. Following his brother's orders, Lakshmana stood at the gate, ensuring that no one was able to enter the quarters. So when Durvasa demanded entry, he politely refused, asking the sage to wait a while, until Rama finished his meeting. The enraged sage threatened Lakshmana that he would curse all of Ayodhya if the latter did not immediately inform Rama of his arrival. Knowing Durvasa's nature, the young prince decided that it would better to disobey Rama and be executed by him, rather than risk the whole of Ayodhya falling into ruin. He interrupted Rama and told him what was happening outside. Rama immediately concluded his meeting and received the sage with due respect. Durvasa told him that he was hungry and wished to be fed. Rama quickly fulfilled his guest's request. Pleased, the sage went on his way. Rama was overcome with sorrow that he now had to execute his beloved brother Lakshmana, for no fault of his own. Still, he had given Yama his word, and hence, he could not go back on it. he approached sage Vasishtha, who advised him to order Lakshmana to leave him for good. He averred that this act of abandonment itself would be equivalent to an execution for Lakshmana. Lamenting at his fate, Lakshmana left and went to the banks of the river Sarayu, intent on renouncing the world through Yoga. Durvasa was also known for granting boons to those who pleased him and gave him the respect due to him. In the Mahabharata, he once blessed Kunti, the future wife of Pandu, when she was a young girl. At that time, she lived with her adopted father, Kuntibhoja. Durvasa visited Kuntibhoja, who entrusted his foster daughter with entertaining the sage and fulfilling all his needs during his stay with them. Kunti patiently put up with all of Durvasa's demands, even fulfilling unreasonable requests such as serving him food at all odd hours of the night. The sage was very pleased with her dedication and devotion and, before leaving, he taught her the Atharvaveda mantras, which enabled her to invoke any God of her choice to beget a child by them. Skeptical and curious to know if it would actually work, Kunti decided to test the mantra. She invoked Surya (the Sun God) and bore her first son, Karna. Fearing her fate as an unwed mother, she abandoned the newborn in a basket and set him afloat down a river. She then went on to marry King Pandu, the ruler of Hastinapura. She had the three eldest of Pandu's five sons, by invoking different Gods with the mantras taught to her by Durvasa. In the meantime, Karna was found and raised by charioteer Adhiratha and his wife, Radha. Adhiratha worked for the ruler of Hastinapura. He went on to become an accomplished warrior and joined the Kauravas; thereby becoming a formidable adversary of the Pandavas. He finally met his end at the hands of Arjuna, the Pandava prince, who was unaware that Karna was, in fact, his elder brother. Once, Durvasa arrived at Hastinapura, along with his entourage of disciples. There, Duryodhana and his uncle, Shakuni, managed to please the sage. Before departing, Durvasa told the Kaurava prince to ask him for a boon. Secretly wanting the sage to curse the Pandavas, the prince asked the sag to visit his cousins, the Pandavas. The Pandavas were in exile at the time. So they were living in the forest, along with Kunti and their wife, Draupadi. Duryodhana knew that Durvasa would reach there only after the Pandavas had finished their meal. They would have nothing to feed him and would thus fall prey to his infamous temper. The Pandavas would obtain their food from the Akshaya Patra, which was given to them during their exile. This vessel would become exhausted once Draupadi finished her meal, after the Pandavas had finished theirs. Things worked just as Duryodhana had planned – Draupadi has eaten just before Durvasa arrived with his disciples. So there was no food left to serve him. This made the Pandavas nervous and anxious. They respectfully requested the sage and his disciples to bathe in the nearby river and told them that they would prepare a meal for them in the meantime. Not knowing what to do, Draupadi prayed to Lord Krishna for help. Krishna immediately appeared, told her that he was very hungry and asked for food. Dismayed, Draupadi told him that she had prayed to him because she had no food to feed the sage and his disciples. Krishna smilingly asked her to bring the Akshaya Patra to him. He took out just one grain of rice sticking to the bottom of vessel and ate it up. After that, he announced that he was satisfied with the "meal" that Draupadi had served him and left. Krishna's act of eating that little morsel of rice satiated the hunger of Durvasa and all his disciples. Not wanting to eat any more; also fearing the Pandavas' reaction at their impolite behavior if they refused food; they all quietly left after their bath, without returning to the Pandavas' ashrama. Kalidasa's great work, the Abhijnanashakuntalam, relates how Shankuntala's life was impacted by Durvasa's temper. One day, she was deep in thought, daydreaming about her lover, King Dushyanta. So lost was she in her fancy, that she failed to notice Durvasa approaching her. Angry at having been ignored, Durvasa cursed her that her lover would forget her. 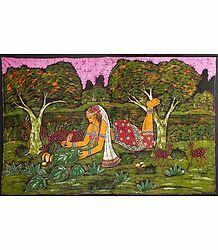 Horrified, Shakuntala fell at the sage's feet and requested him to take back his curse. Unable to do so, he softened his curse, saying that Dushyanta would remember her when he saw the royal ring he had given to her as a token of his love. The curse eventually took effect – Dushyanta failed to recognize Shakuntala when she walked into his court with their love child, Bharata. He remembered only much later, after a fisherman discovered the ring in the belly of a fish he had caught. Recognizing the royal seal, he took it to the king. When he saw the ring, the curse lifted and he immediately recalled the wonderful times he had spent with Shakuntala. The two lovers reconciled after that and went on to lead a happy, peaceful life. 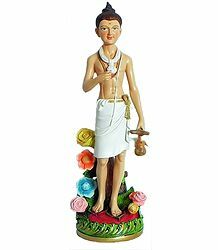 According to the Swaminarayan sect, Narayana (Lord Vishnu) incarnated as Saint Swaminarayan, due to a curse by Durvasa. Their version of the story relates that, after Krishna's passing, Uddhava, a close friend and counselor of Krishna, proceeded to Badrinath, the abode of Nara-Narayana. Once there, he, along with several divine sages and seers, sat absorbed in Nara-Narayana's discourses. At that time, Durvasa arrived from Mount Kailash. Everyone was so absorbed in the discourse, that no one saw the sage enter. Durvasa waited for about half an hour for someone to notice him and invite him in. When no one rose to receive him, he got furious and cursed the entire assembly that they would all be reborn as humans and would suffer insults and agony at the hands of the wicked. Nara-Narayana's parents, Lord Dharma and Goddess Bhakti, rushed to pacify Durvasa. He then softened his curse saying that Lord Narayana Himself would be born to them as their son. He, being the Supreme One, would free them from the clutches of evil. So saying, he left the place. Dharma and Bhakti were then reborn as Hariprasad Pande and Premvati Pande respectively. Narayana was born as their son and he was named Ghanshyam. Later, he rose to great spiritual heights, eventually becoming known as Swaminarayan. It is important to note that the above legend is exclusive to the followers of Swaminarayan. None of the traditional Hindu texts or scriptures mentions this story. It is commonly believed in Hinduism that the placing of planets in a person's horoscope can directly affect his or her behavior patterns. However, the fact is that, powerful rishis such as Vishwamitra and Durvasa were trikala-jnanis. They were cognizant about the past, present and the future and constantly worked for the better of the world and all its beings. Whenever Durvasa gave a curse, it was only because he saw the person failing to adhere to the Dharma. He himself was always righteous and unwavering on the path of the Dharma. He proved by example that, if you are on the higher path of spirituality, you have a right to be angry at others for not doing so. In that sense, both the rishis were justified, as they constantly encouraged people to follow the right course. Besides, considering the bigger picture, their curses helped people release their karma, by letting the cosmic drama of Samsara unfold in their lives.